The SFO-HKG still employs the 747, but as Cathay continues its strive for efficiency, sooner or later SFO will start flying the 777. First Class enthusiasts, take note! 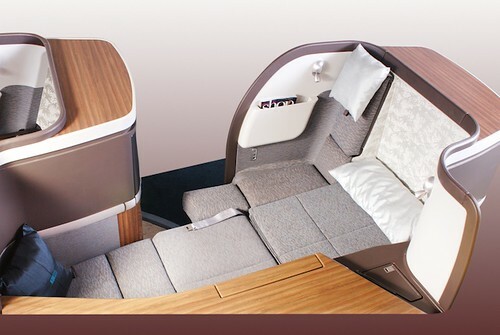 Enjoy the B747 First Class configuration before it disappears. 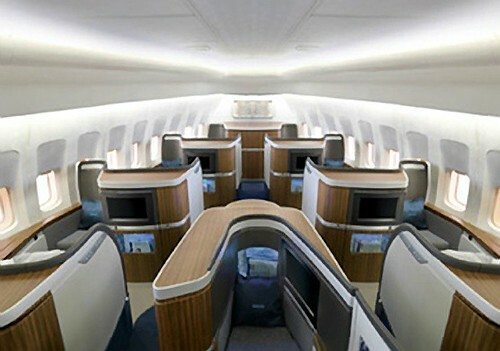 While it has not really affected much of the Economy class except for its configuration, it has a slight effect on the Business Class and more so on the First Class. With regard to the Business Class, instead of a double decker seating option, it is now one long area sandwiched between First and Economy. The first two rows are especially nice as they fall right behind the First Class cabin and are separated from the rest of the Business cabin by a galley and an exit door. 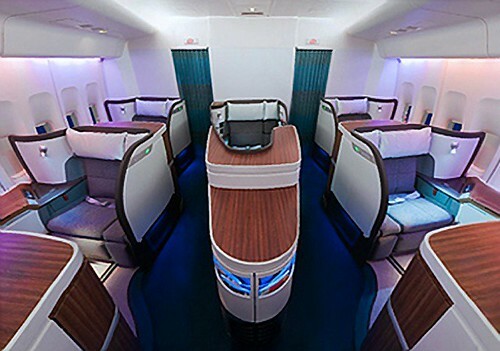 The First Class is a much truncated version of the B747 version: There are six suites instead of nine, configured in a 2-2-2 arrangement, instead of the B747’s four suites on each side of the wall and one as an island toward the back. The striking difference are space and privacy. When it comes to First Class on Cathay, I’ve flown mostly on the 747. Only once, in January 2010 from HKG to CGK (Jakarta) did I fly a rare First Class seat on a CX777 using B777 (I know, right? Neat flight number coinciding with the aircraft type.) Recently, the CX777 HKG-CGK uses the 3-class aircraft again, but it is still the exception. Flight manager informed me that they might do this once a week of all the twice-daily flights for this route, so one just has to check to see which of the HKG-CGK route employs the 3-class aircraft. View of the B747 First Class Cabin from behind, a photo by bloompy on Flickr. View of B747 First Class Cabin from up front, a photo by bloompy on Flickr. With the 747, located toward the nose of the aircraft, seats 1A and 1K have the shortest distance to each other, making them perfect place for a traveling couple. Seats 2A and 2K have a farther distance. Seats 3A and 3K have the farthest distance from each other, but it is cleaved in the middle by a peninsular counter, a sort of a “waiter’s station” that is connected to the lone “island” suite of seat 4D, which brought us to seats 4A and 4K, the last row of seats with bassinets capability, and the ones with perhaps the least amount of space in between and the least privacy. Cathay Pacific First Class Suite, a photo by bloompy on Flickr. With the galley of the First Class located frontward, the bulkhead suites of 1A, 1D, and 1K do not have much privacy. When an FA opens up the curtain, s/he can immediately see you in the suite (not so with the B747 rows 1-3). In 777, therefore, the second and last row of suites would be more private as the curtain behind would lead to Business Class. There would be less activities back there. 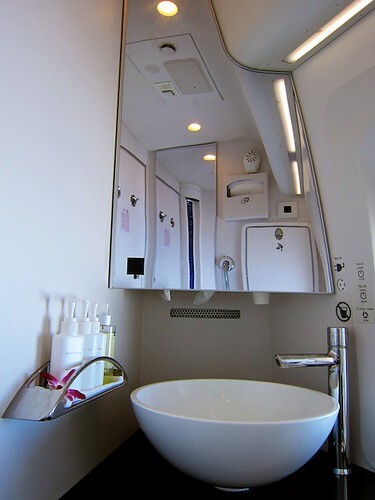 Cathay Pacific B747 First Class Bathroom, a photo by bloompy on Flickr. The Bathroom is another difference between 747 and 777. At the former, not only is it spacious, but the wall is pierced by two windows, flooding light into the space during the daytime, making the place seem much more spacious. Both bathrooms on either side of the aisle are mirroring identical. Vanity and Sink Area, a photo by bloompy on Flickr. The 777’s two bathrooms are located frontward between the galley and the pilot’s cockpit. They face each other but are in no way identical: One is small and the other is big. The small one is just like any bathroom in the Economy class, with the exception of the nice white bowl porcelain sink and cloth towels. The other bathroom is slightly bigger, but not by much. It has a “Murphy” bench that covered the commode and then some (much like a Murphy bed, it can be pulled down and stored closed up when needed.) One major omission in these bathrooms are the windows. That detail may be small, but it creates a big difference. 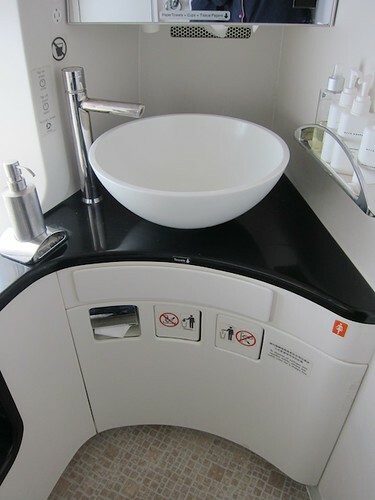 This bathroom looks dark and small, compared to its B747 counterpart, shown below. 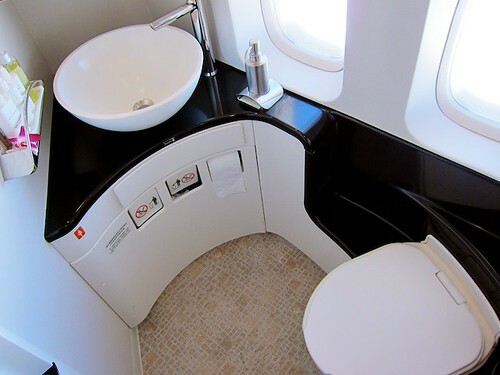 Overview of First Class Bathroom, a photo by bloompy on Flickr. Believe me, those windows really make a HUGE difference. IMG_2625 – Version 2, a photo by bloompy on Flickr. It is not known yet if and when SFO originating Cathay fleet will change to the B777. Of the two SFO-originating Cathay Pacific flights, only the nighttime one (CX 873) still operates the B747. The daytime flight already seems to use the B777. The SFO-HKG route, as opposed to the LAX-HKG flight, is about one hour less in terms of flight duration. 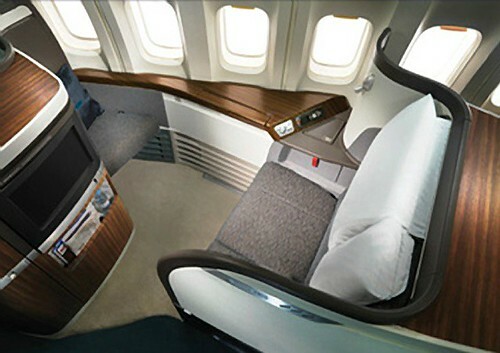 Personally, if you are going to fly Cathay Pacific First Class, I would fly the B747 until Cathay discontinues it. It makes sense, because in the near future, you will have no option but to fly the B777. This entry was posted in Airlines, Blog, Travels and tagged airlines, cathay pacific, first class seats, travels by bloompy. Bookmark the permalink. 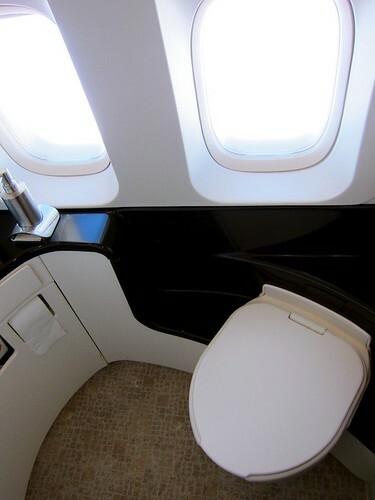 That is the coolest bathroom I’ve ever seen in an airplane! I know, right? Way cool bathroom, but again, the B747 is being phased out in favor of B777, and the bathrooms in B777 is nowhere close to this one.